Air Force 2 / Isomax Acoustic Silencer Fan - 6" (150mm) 410 m3/hr Iso-Max is a totally unique diagonal tube fan, designed to be efficient, powerful and silent. Iso-Max, like Max Fan, uses the rotor-stator system that enables it to be efficient, air performance and power consumption wise. .. The Air Force 2 Isomax Acoustic Silencer Fan (6”) is currently the best fan on the market for distributing air around the grow area. The fan is powerful but lightweight and extremely quiet. This fan is perfect for large and small grow areas alike. Integrated Silencing Technology High Torque ..
Air Force 2 / Isomax Acoustic Silencer Fan - 8" (200mm) 900 m3/hr Iso-Max is a totally unique diagonal tube fan, designed to be efficient, powerful and silent. Iso-Max, like Max Fan, uses the rotor-stator system that enables it to be efficient, air performance and power consumption wise. &n.. The Air Force 2 Isomax Acoustic Silencer Fan (8”) is currently the best fan on the market for distributing air around the grow area. The fan is powerful but lightweight and extremely quiet. This fan is perfect for large and small grow areas alike. Integrated Silencing Technology High Torque ..
Air Force 2 / Isomax Acoustic Silencer Fan - 10" (250mm) - 1480 m3/hr Iso-Max is a totally unique diagonal tube fan, designed to be efficient, powerful and silent. Iso-Max, like Max Fan, uses the rotor-stator system that enables it to be efficient, air performance and power consumption wise. &nb.. The Air Force 2 Isomax Acoustic Silencer Fan (12”) is currently the best fan on the market for distributing air around the grow area. The fan is powerful but lightweight and extremely quiet. This fan is perfect for large and small grow areas alike. Integrated Silencing Technology High Torque..
Air Force 2 Isomax Acoustic Silencer Fan (10”) The Air Force 2 Isomax Acoustic Silencer Fan (10”) is currently the best fan on the market for distributing air around the grow area. The fan is powerful but lightweight and extremely quiet. 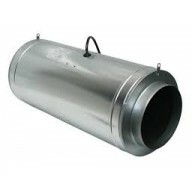 This fan is perfect for large and small grow areas alike. ..
Air Force 2 Isomax Acoustic Silencer Fan (12”) The Air Force 2 Isomax Acoustic Silencer Fan (12”) is currently the best fan on the market for distributing air around the grow area. The fan is powerful but lightweight and extremely quiet. This fan is perfect for large and small grow areas alike. ..